Acrylic on Canvas - 28" x48"
When Michael was asked to do a new cover for Ray Bradbury's classic THE MARTIAN CHRONICLES, he reread it and found he was deeply moved by the sense of inevitable tragedy that permeates the first half of the book. He was also struck by the weirdness of the Martian culture and noted that the cities were said to be like bones. He liked the metaphor enough to use bone and corallike forms for the architecture. 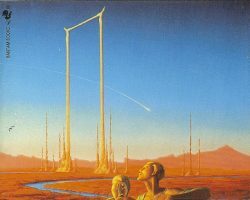 Harkening back to legends of comets being harbingers of doom, the trail of the descending craft from Earth became the chief symbolic element in the painting. The strange and wonderful tale of man’s experiences on Mars, filled with intense images and astonishing visions. Now part of the Voyager Classics collection. 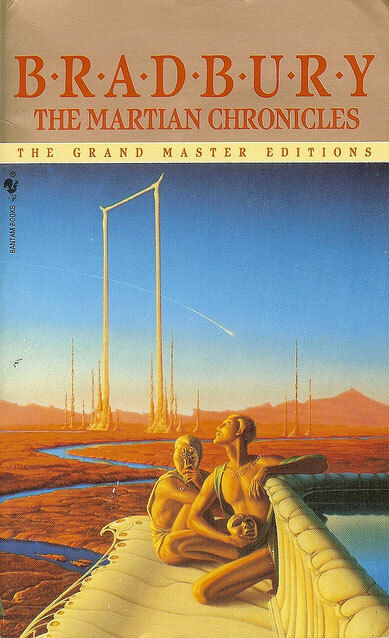 The Martian Chronicles tells the story of humanity’s repeated attempts to colonize the red planet. The first men were few. Most succumbed to a disease they called the Great Loneliness when they saw their home planet dwindle to the size of a fist. They felt they had never been born. Those few that survived found no welcome on Mars. The shape-changing Martians thought they were native lunatics and duly locked them up. But more rockets arrived from Earth, and more, piercing the hallucinations projected by the Martians. People brought their old prejudices with them – and their desires and fantasies, tainted dreams. These were soon inhabited by the strange native beings, with their caged flowers and birds of flame.